JR12 - Quantum Devices, Inc.
Quantum Devices, Inc. Model JR12 provides an improved feedback solution in applications typically using pancake resolvers with same threaded shaft and jam nut mounting. 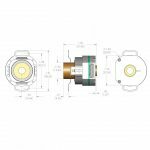 With an over all height of less than one inch and the stability of a bearing encoder design, the model JR12 can provide significant performance upgrades in applications limited by traditional resolvers or modular encoder solutions. Output options consist of a quadrature with index pulse and three-phase commutation. 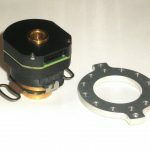 A flexible member allows for much greater tail shaft run out and TIR than can be tolerated by modular encoder designs, plus the mounting flange eliminates the need for expensive servo mounting clips. 0.250" Tolerance: -0.0000, + 0.0010"
bore:* - Please Select -.250"